The garden is definitely recovering now that the extreme heat has eased off. It’s mid April 2009, and the garden is resuming its task of growing, as gardens do! 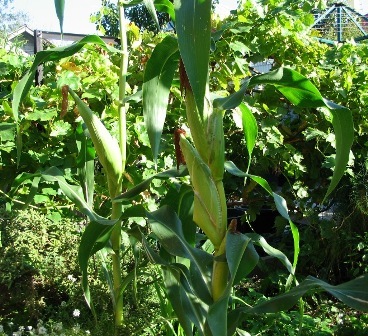 Even though the hydroponic Balinese Sweet Corn was virtually destroyed by the harsh weather last month, the corn in the garden beds is growing nicely, almost ready to harvest. You know it’s time to harvest corn when the tassels turn a dark brown and start drying. Black mulberries (Morus nigra) fruit several times a year,. The berries go from the red you see on the left to the black ripe berry colour on the right. This mulberry is just growing in a 45 litre pot, and it’s fruiting plenty. I haven’t been able to weigh all the produce from this little tree (its only five feet tall) because guests keep eating the berries when they visit! If this is planted into the ground, it will grow into a huge tree of about 30 feet in height, and will form a bush is it’s not pruned to shape. 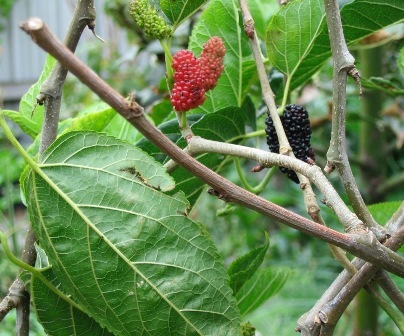 Black mulberries are long-lived trees and can bear fruit for hundreds of years. 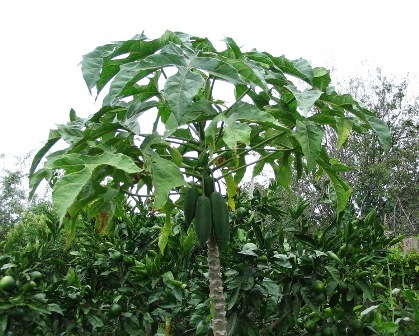 This is a tropical Babaco tree. 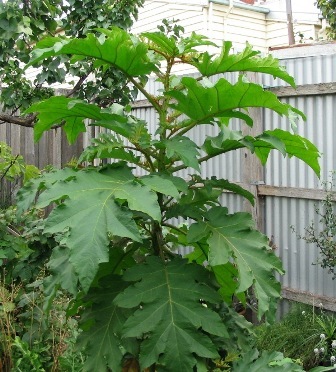 Yes, it’s a tropical tree that grows well in the cold Melbourne climate. The Babaco (Carica pentagona) is also called "champagne fruit" because fruit has an effervescent (fizzy) taste, and the flavour can be described as a blend of strawberry, pineapple and pawpaw. 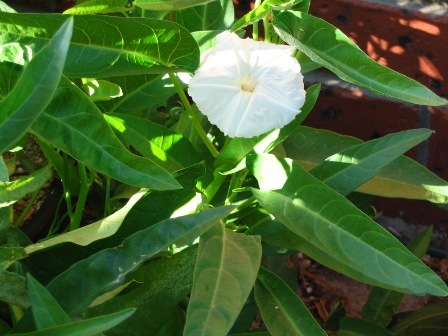 This plant is a close relative of the pawpaw. It fruits quite heavily and is very productive. The fruit turns yellow when ripe, and each fruit can typically weigh 0.5 – 1kg and reach around 20-52cm in length. 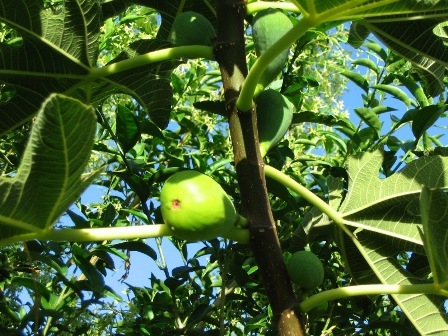 Between October and December it has already produced over7.5kg of fruit, and as the fruit are ripening, new flowers emerge for new fruit to begin. It basically is almost constantly fruiting. Incidentally, there are no seeds in the fruit, it is sterile, so if you wish to propogate it, it is done using cuttings. 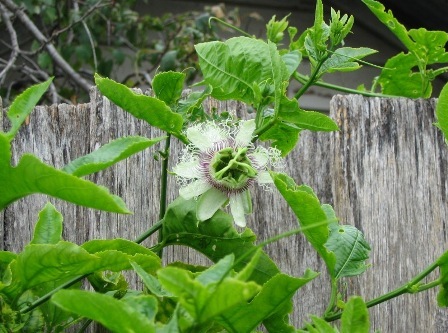 The Passionfruit vine is starting to flower! This is a Black Passionfruit, and it looks like it has about 5 fruit on it. Mind you, it was only planted recently. Be warned, these are deceptive. I was told by a friend that the first year they planted theirs, it yielded only ten fruit… Just when you think no more of it, well, the next year, they stopped counting at 400 and it produced way more after that. I was told they had to find every conceivable recipe for passionfruit to use all the produce. These are grafted onto a particular rootstock, which will send runners through the garden, which will emerge some distance from the vine. 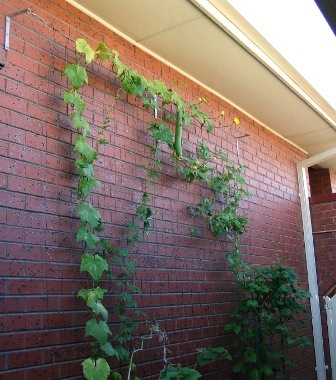 You can recognise them by their climbing habit and their different shaped leaves. Remove these suckers as they are not productive and will diminish the growth of the main plant. 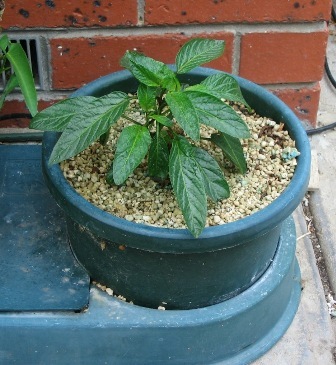 Here is a heavily laden chilli plant. 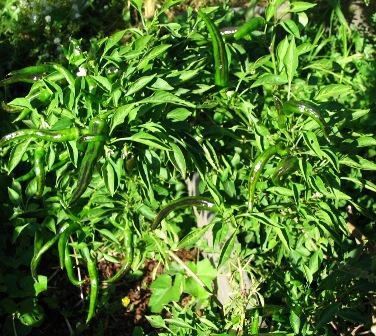 The green chillis turn red on this plant, I believe it is perennial, and should produce a large quantity of very large and very hot chillis. I’m not sure what the variety is, I’ve been told it’s an Italian one. 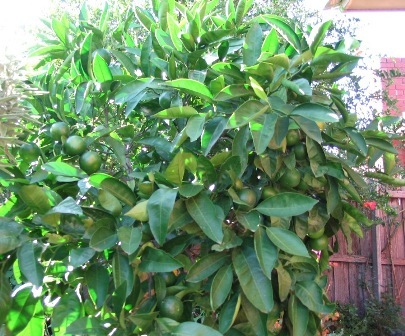 This is a mandarin grafted onto a grapefruit tree. It’s covered in mandarins, which are just starting to ripen, they’re still green here. 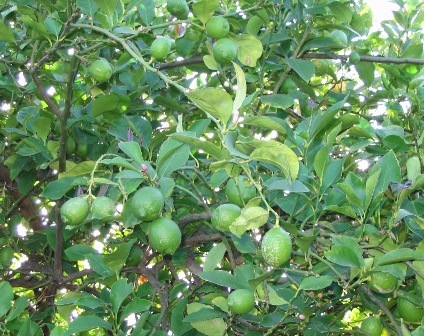 There will be lots of lemon too – from the neighbours overhanging lemon tree! We have an arrangement, as I have a pomegranate tree that overhangs in their backyard, so we share the fruit that way. nothing like sharing the surplus and increasing your variety. There’s something to be said for having a sense of community. 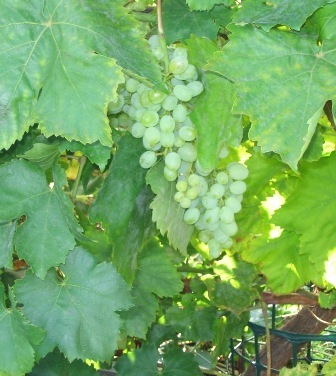 Ripening sultana grapes. this year I sprayed the fungicide early enough to get produce out of the grape vine. Timing is everything. And make sure you use the copper based fungicides that are compatible with organic gardens, or lime sulphur, and not the nasty chemical varieties! Remember, what you put into your garden, you put into your body. Keep it healthy! Raspberries almost ready to harvest, with some green ones around them. This variety of raspberry produces over a long period of time, and one plant in a 12" pot has almost turned into about thirty, which were transplanted into two rows along a wire to support them. 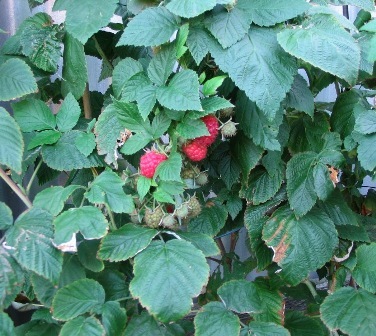 Since October, these plants have produced close to half a kilo of fresh berries, and they are still going. I’d say it’s the best $10 I’ve spent on berries. 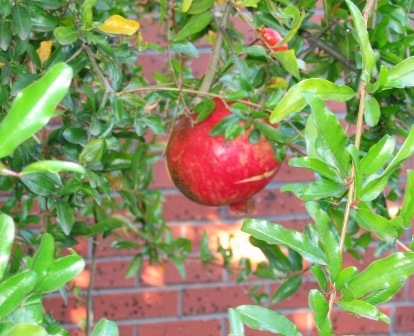 The first pomegranates are beginning to ripen, as seen below. They’re ripe when they are bright red, and the points at the tip start to turn inwards. If the fruit has split, it is engorged with juice and is definitely ripe. Be warned, these fruit are very messy and stain quite badly, but do taste delicious. They are a drought tolerant tree as they are of Mediterranean origin, great for a garden that doesn’t get too much water. The tree grows to about 4m high by 4m wide. It’s a reasonably small tree that can fit in virtually any back yard. Pomegranates do not grow true to seed, so if you grow them from seed, there’s no telling what the fruit would taste like. Luckily, growing them from cuttings is ridiculously easy, and you can produce so many new plants you’ll have plenty to supply all your friends. Every year I propagate about a dozen of them and give them away. The old Pepino gave way after a hard summer, it has been replaced by one of its cuttings. Thank goodness for propagation by cuttings! 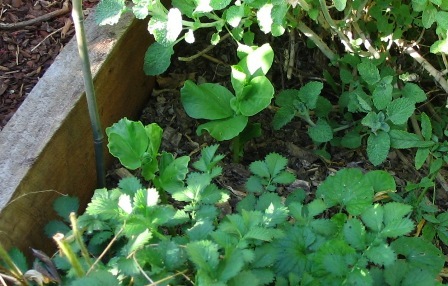 Water Spinach in flower, growing hydroponically. This is an aquatic/marginal, and it’s growing favourably in the hydroponic system, due to the fact that it can draw as much water as it wants from the system. 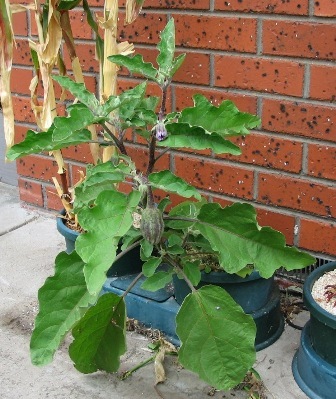 A hydroponic eggplant, beginning to fruit. This is where the eggplant is meant to end up, grafted onto this monster, it’s a spiny relative, called a Devil Plant, Soda Apple, or Roach Berry. 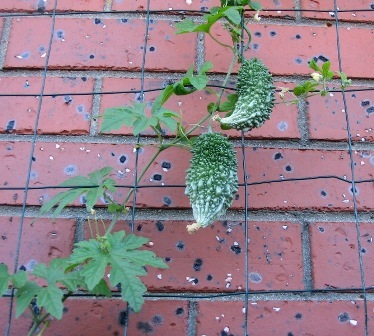 It grows into a small tree, and if you graft eggplants onto it, it can yield hundreds, literally. The only thing necessary is to cover it in winter so the grafts don’t die off. Hopefully the eggplants will grow in time to yield cuttings to graft with. Incidentally, you just use simple cleft "V" grafts, and the bits you cut off this plant can be used as cuttings to grow new plants, either root the cuttings in water, or in potting mix. Climbing cucurbits. 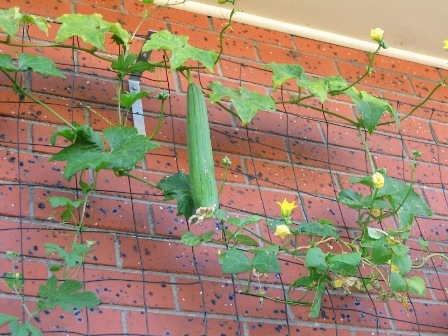 the Loofah sponges are growing bigger, and there are more flowers on the vine! These strange little cucurbits are Bitter Melons, they are an Asian vegetable that is eaten and also used for its hervbal properties, it is a traetment for diabetes. 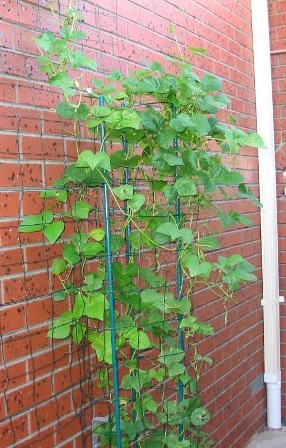 Climbing beans running up the wall with the cucurbits. These have been producing well, both in the ground and in the hydroponic setup. Back to water conservation. I dreaded to watch the rain on the concrete wash down from the middle of the yard and down the side path, over the driveway and into the street! 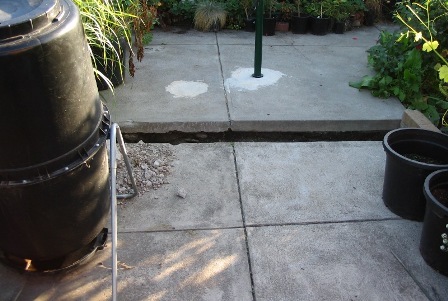 There had to be a way to divert the scarce rainwater into the garden. 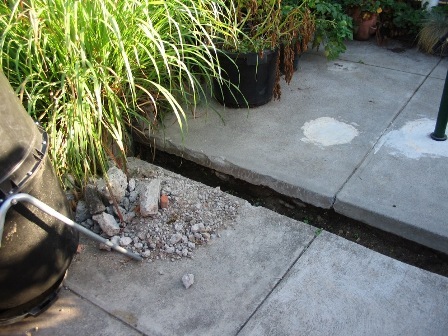 The solution… a French Drain. I simply cut a channel across the concrete with a 230mm angle grinder equipped with a masonry cutting disc (warning – extremely dusty, wear a face mask!) 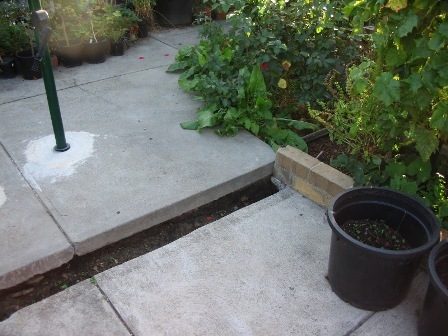 to catch the water and divert into the garden beds on either side. Soon I will fill it with gravel and it will then be complete, for now it’s just another gutter! That’s what I can do in my garden around the garden beds too!